BiodivERsA is pleased to announce the launch of its next call on the theme “Biodiversity and its influence on animal, human and plant health”. Action B will support research synthesis projects (2), gathering individuals forming a working group who perform research and answer research questions using existing data sets. These research projects won’t collect or produce new primary data, the core activity of these projects being synthesizing and/or analyzing existing data (synthesizing concepts and ideas is also eligible). Note that these projects differ from systematic reviews or knowledge synthesis which are based on a synthesis of publications and reports. The call is planned to be launched in early October 2018, with the mandatory submission of pre-proposals in November 2018 [Indicative schedule]. group members from minimum 5 countries participating in the call for Action B (a particular rule may apply for ORs/OCTs if the corresponding agencies confirm their participation). Proposals will have to be exclusively written in English. 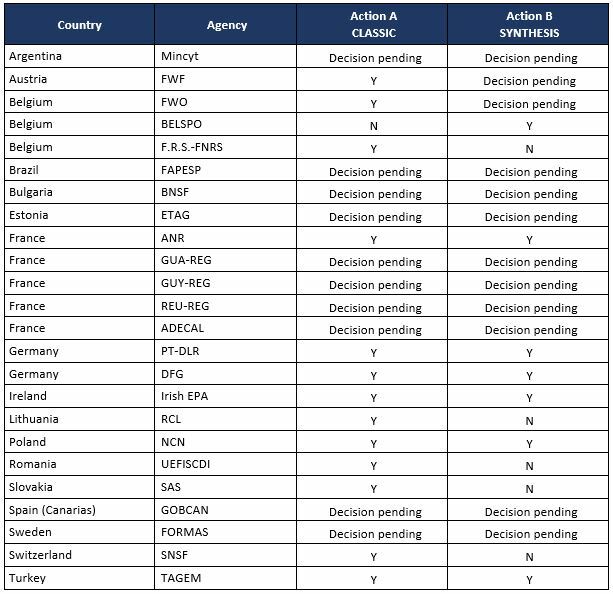 At this stage, the following countries have expressed a preliminary interest to participate to the call (Y=Yes ; N=No). !! Please note that this list may evolve, pending final decisions by Funding Organizations !! The list of participating countries will be updated on the BiodivERsA website and on the 2018 Joint Call page. We invite you to regularly consult the BiodivERsA website and the 2018 Joint Call page, on which information on the call will be regularly updated. For more information on BiodivERsA, click here.